elearning is not a new technology. It’s been around in various forms since the 1980s, though today’s elearning is miles away from the rudimentary programs kids took in computer labs back when Macintoshes and Rubik’s Cubes were new. However, even though elearning now has a fairly long use-case history, there are still many training managers (and others) who have doubts about its efficacy. But the fact is, correctly designed and applied elearning is an innovative technology that can improve companies’ safety training programs. It can improve training coverage, lower training costs, and increase compliance with training goals. elearning can reduce accidents and injuries. In short, elearning can increase the bottom line. This is the big question that we are most often asked to answer: Is online safety training as effective as instructor-led safety training? After wrestling with this question for the past 10 years or more, we believe that neither instructor-led training or asynchronous elearning is inherently better than the other. The best training outcomes are achieved when they are used together. Let us tell you why. At its worst, asynchronous elearning is simply a toggling PowerPoint slide deck with a multiple choice test at the end. For purposes of this discussion, when referring to “online training,” we are referring to self-paced, online safety training delivered asynchronously. For the purposes of this discussion, we are defining “safety training” to include training objectives involving compliance with regulations, standards or organizational policies involving environmental, occupational health, occupational safety, and/or human resources subjects. A college professor typically has at least semester or more to impart knowledge to students, and have the student largely take ownership for his or her own long-term learning. Contrast this with an instructor hired by an employer to deliver, for example, a HAZCOM course to group of employees. The instructor has been hired to train these employees on their rights and responsibilities under the standard, the hazards they are potentially exposed to, and how they can mitigate those hazards. The idea is to get them trained and back on the job, working safely. In this scenario, the instructor bears more relative responsibility to ensure that the learners absorb the material in a meaningful way than the college professor. With little exception, simply failing an employee because she didn’t pay attention during the lectures is not an option. It’s widely understood that with safety training, it’s not enough to show that an employee has been trained. Showing that the learner was able to parrot back information in the form of a multiple choice test is not sufficient, though this approach is common in corporate and industrial training programs. Ideally, employees must demonstrate that they actually learned and achieved competency in performing the job safely. An effective EHS training program must, through job hazard analysis, establish direct links between identified hazards and impacts associated with the employee competencies required to mitigate them, as well as the training designed to deliver those competencies. Safety training and other types of employee training can generate greater employee “buy in” through good instructional design, which in turn relies on a good understanding or adult learning theory. In terms of learning, adults have different values and priorities than children. Adults value knowing why they are being required to learn material, and having the necessary information explained as clearly, concisely and logically as possible. Tying training to identified competencies in such a way that adults will understand and pay attention to them is not always easy. When designing this type of training, it’s best to take a methodical approach such as instructional systems design, also known as ISD. The most common ISD model is called the “ADDIE” model – Analyze, Design, Develop, Implement and Evaluate. In the “analyze” and “design” phases, the audience is carefully defined and their needs are recognized. The subject matter is clearly outlined, and the most logical order of presentation is derived. This approach perfectly dovetails with the typical adult learner’s needs: targeted, common-sense information designed to fulfill a specific, defined goal. Unpacking just that one sentence can provide us with several terminal learning objectives, or competencies, that must be communicated to the learner and verified. “Putting on and removing” respirators is an entire process requiring respirator selection, initial fit testing, and then a step-by-step process for correctly donning and doffing the respirator. There will also be some eye protection and skin protection, but just taking the respiratory protection into account, we can formulate a competency statement such as “the learner will demonstrate the ability to identify the correct procedure for donning and doffing a half-mask respirator.” This is one of the terminal learning objectives the learner must be trained on; the hazard has been identified through a standard job safety analysis, and the hazard mitigation has been identified through application of the OSHA regulation. Now, we must create training that will enable the learner to perform the action we’ve set forth: identify the correct procedure for donning and doffing a half-mask respirator. This training must contain two components. First, we must give the learner the information needed to demonstrate the competency. Then, we must create an exercise or test that allows the learner to demonstrate the competency. In a more traditional training scenario, the learner would simply answer a series of multiple-choice or true/false questions. Ideally, the learner would perform the donning and doffing of the respirator in front of the instructor, and receive immediate feedback. With elearning, it’s possible to create interactive exercises in which the learner performs the required action, and receives feedback/remediation when the action is performed incorrectly. Now that we’ve emphasized the importance of good, thoughtful design in training – in both elearning and conventional offerings – we can begin exploring some of the benefits elearning offers. Again, it’s important to note that these benefits depend on quality training design and execution. elearning that offers nothing more than fixed text bullets, monotone spoken narrative and static, possibly irrelevant images is almost guaranteed to bore learners and have the opposite of the desired effect. It is not uncommon for a company to save as much as 80% in direct costs by supplanting their conventional training approaches with online safety training. In 2013, an oil and gas drilling company with approximately 1,600 employees employed 12 full-time instructors. After transitioning to a mostly online program, the company was able to reassign most instructors to operational positions, with three instructors supporting the irreplaceable components of the conventional program. While one position was required for managing the online program, more than $1 million was saved annually in salaries and travel costs. 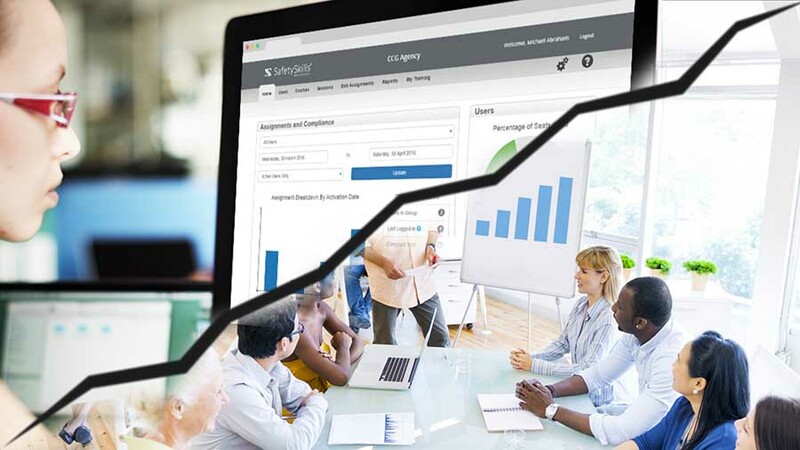 Offering employees training online can make all the difference in getting them compliant with an organization’s training requirements. For example, in 2006, we were engaged by a boutique insurance company that insured regional grocery chains. The company had just one safety consultant and was unable to reach all workers across all stores and all shifts during the calendar year. We performed a series of job hazard analyses to identify target competencies and reviewed claims data to identify target employee skill gaps. Then we built a set of web-based, interactive modules focusing on those competencies. The program was launched as a pilot project to 8 stores employing approximately 1,000 employees. After one year, the insurer reported a 55% reduction in claims with more than $200K in avoided payouts, as compared to the control group. Over a period of 10 years, we provided Environmental Compliance Officer training for the U.S. Army in Europe. The course was designed to empower U.S. military and civilian defense personnel to manage EHS programs that comply with both U.S. and host-nation requirements. It’s a 32-hour, conventional, instructor-led course that we delivered at 22 locations throughout Belgium, Germany, Italy and The Netherlands. In 2006, we were asked to build an analogous set of online curriculum for personnel who were not able to attend the conventionally-delivered training due to a higher level of deployments. It was important that it not be a “scaled down” version, but the full course of training those attending the instructor-led version were receiving. Breaks. Several breaks throughout the day. In a classroom setting, this is ‘dead time’. At a desk, when an employee breaks from elearning they are more likely to go to another work task and at least aren’t waiting on other students to re-start. Questions. We were surprised by how few real questions were being asked. Many student questions in a conventional setting are not asked to request clarity on a topic. They are often an opportunity for the student to demonstrate his or her own mastery of the subject, or even contradict the instructor. Genuine questions were usually answered quickly, whereas comments or ‘leading questions’ took more time to respond to. Varying Aptitudes. Not everyone in the classroom has the same aptitude for every learning objective contained in the training. The course needs to be designed so that it allows sufficient time within each learning objective to train those with the least aptitude. Online training is of course “self-paced” for each learner. Tangents. While the occasional tangent can provide perspective, and help cement knowledge, too many tangents cause the course to be disjointed and lose focus. elearning eliminates tangents, but still provides opportunity for developers to build relevant stories or examples into courses. Site Visits. While a valuable tool to help demonstrate classroom knowledge, site visits are inefficient in terms of time. Walking/driving to the site and back, the ‘herding cat’ mentality for large groups, bathroom breaks, all cause time delays. Padding. In a conventional lecture, the instructor can be a slave to scheduling. With a smaller class with few questions, a lecture maybe done 15 minutes early, with exercise completed. The instructor either performs an additional exercise to pad for time, or allows a longer break. Ultimately, it is the ‘day schedule’ that is driving the class, leading to further inefficiency. Oftentimes, a conventional course is put together for an organization to accomplish multiple compliance goals. For instance, we’ve been asked many times to deliver a course in hazardous materials management that is designed to satisfy the training requirements of applicable OSHA, EPA and DOT regulations. This approach is often due to economics and it is rare for each employee to need all aspects of the training. While this approach may be more financially expedient, it can impact the efficacy of the training. Online safety training allows organizations to assign infinite combinations and permutations of learning modules to individuals targeted exactly to their individual requirements. There is no need for learners to be presented with any training that is irrelevant. We often have multiple instructors in the field on a contract, teaching the same course at different locations to different audiences. It is natural for instructors to embellish and edit quality-controlled courses with their own stories and experiences. While this in itself is not a bad thing, it can detract from a targeted, on-point message. elearning helps solve this issue by providing only one version of the course content that is accessible to learners through the learning management system. Safety training is often updated to reflect changes in both mandatory regulation and company policy. A number of years ago, a utility client of ours had experienced an injury related to trenching operations. New standard operating procedures were disseminated throughout the company, and training materials were amended to include the changes. However, after the change, an incident investigation of a near-miss, also involving a trench, revealed that the additional precautions had not been implemented at the worksite. Through root-cause analysis, it was discovered that the employees responsible were “trained” just six months previously, but not with the updated materials. Elearning updates, made and disseminated at the corporate level, eliminate this issue. Benefit #7: elearning Offers Flexibility in Delivery Settings, Devices, Etc. We have many clients with workforce distributed across the country. Many employees are not office- or plant-bound and, depending on the company, might be sales representatives, delivery drivers, oil-platform riggers or any number of other “field” positions. The employees in the field are assigned online training, while those working in the facilities received their training in groups, delivered either by an instructor or a training coordinator. 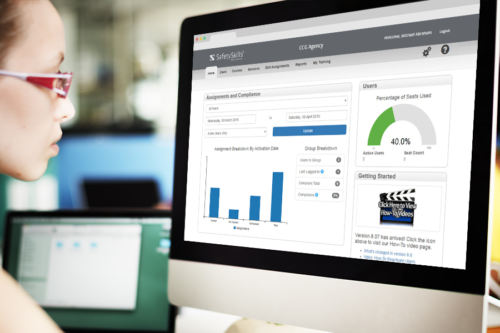 Training assignments are deployed via a learning management platform ensuring the right training is assigned to the right employee, whatever their role, and wherever they may be. Now that we’ve gone over some of the main benefits of elearning, we must look at the other side of the coin. 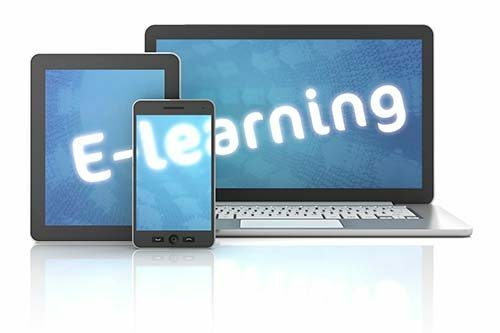 The fact is, even with all the cost-saving, time-saving and consistency benefits offered by elearning solutions, there are times when it just cannot – and should not – take the place of well-designed, conventional training delivered by a knowledgeable, competent instructor. For example, there are several online safety training providers that will provide certificates for a 40-hour HAZWOPER General Site Worker course. In our estimation, this is irresponsible at best. While much of the required content in this course (e.g. toxicology and site control) is appropriate for elearning delivery, there are several other necessary components of the training that are not. This training includes learning how to properly don and work with advanced chemical protective clothing and respiratory protection. The terminal competencies include employing a self-contained breathing apparatus within a vapor-tight, fully encapsulated chemical suit. Any reputable course should require students to dress out and work in the gear in simulated conditions, under the supervision of an experienced instructor. We have assisted in the delivery of this course at least a hundred times. In the class, the students dress out in Level A and Level B ensembles and work under simulated conditions. These conditions have included abandoned warehouses, flight lines, and even the city streets of a mock village. Invariably, there are people who, for a number of different reasons, discover that they are not going to be comfortable enough in the gear to work safely in an uncontrolled environment. Working within this gear can be highly stressful and taxing, and many people simply cannot do it. It’s best to discover this before they are on the actual work site. Other topics that are best taught in-person are demonstrating competency with direct reading instruments. This must be accomplished by using the equipment with sample atmospheres, as well as effectively communicating by radio with other roles within the Incident Command System. These competencies are all critical to on-site safety. The idea that someone can sit down and complete 40 hours of training online, hand their certificate of completion to a site supervisor and say that they are ready for their on-the-job training is unrealistic, bordering on absurd. While currently available technologies allow us to create amazing, game-based simulations and interactivity, we have yet been able to provide a sufficiently realistic experience to fulfill some of the more rigorous safety competencies. There is also something to be said for the subjective, unquantifiable advantage of having a sentient being delivering the training. Often, online safety training is more about the organization “selling” an idea, rather than actually achieving a competency that they didn’t previously achieve. For instance, a typical head protection course is more about schooling the employee on why he or she should wear the hard hat and convincing them to wear the hard hat than it is about actually “how” to put on the hard hat. 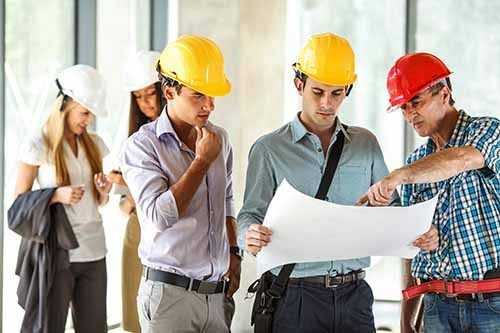 The technical difficult of donning a hard hat is not the problem; getting buy-in from employees so that they will put the hard hat on each and every time they need to is the real challenge. In light of this, it’s easy to see why it’s difficult for a self-paced, computer-based course to convey that the employer has a real sense of concern for the employee’s safety. Tone of voice, facial expressions and face-to-face communication employed by a human instructor are much better at conveying a sense of importance. Furthermore, training in advanced subjects – or even advanced levels of basic subjects – often requires a more dynamic event than most linear elearning courses can perform. 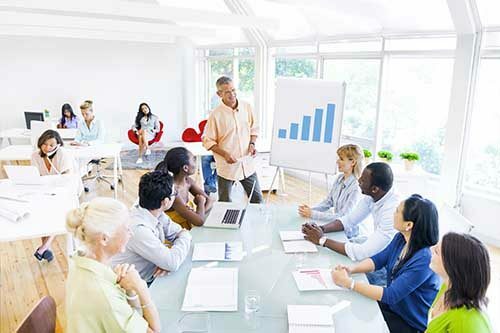 Often a “training” event is also a form of consulting for an organization in which the clients are both learning about the subject, receiving specific guidance or work deliverables and even network and developing new relationships within the organization. Most effective EHS training programs employ both modalities. Their training matrices identify which competencies can be effectively delivered online, and which require in-person training. Actually, significant improvements can happen when we “blend” modalities to achieve a single competency. Many of the conventionally-delivered training services we deliver today incorporate some component of elearning. For example, our Hazardous Materials Management course, which was historically a 40-hour instructor-led course delivered in a classroom, is now “blended” with supporting elearning modules. After registering for the class, students are assigned a series of training modules designed to meet specific enabling learning objectives, which are to be completed prior to the training event. Then, in the classroom, the instructor’s curriculum focuses on the application of these concepts. In other words, while much of the “what,” “where,” and “who” is delivered online, it all comes together with the “why” in the classroom. There is a need for consistent messaging across an organization on policy or procedure. The organization experiences a higher level of attrition, or employees are distributed among multiple locations. The cost of labor is significant and the company can benefit from the enhanced efficiency. The company employs people with similar roles, in the same place, experiencing the same hazards. The training required is in an advanced subject or to an advanced level and more academic in nature. When a “hands-on” experience is critical to the learning event. SafetySkills developed a comprehensive White Paper covering the differences between eLearning and Conventional training with the purpose of helping our readers decide which is best for their situation. This article is a summary of the White Paper.